In order to succeed, we need the best tools at our disposal. We need to understand whether decisions will lead to success or failure, and we need policymakers and investors to have access to that information. Remarkably, almost all energy decision-making is based on assumptions that we will fail in meeting the Paris climate goals. This includes the go-to source for descriptions of our energy future: the International Energy Agency (IEA). 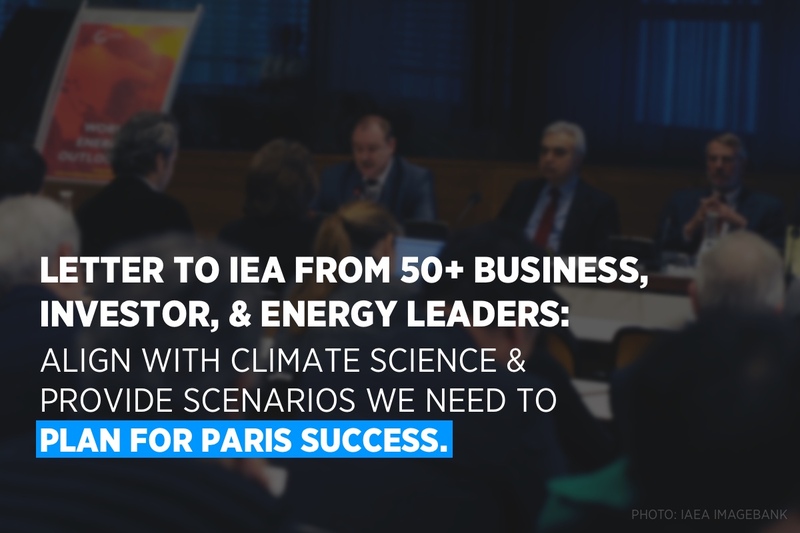 Today, over 40 business leaders, investors, and energy experts found remarkable alignment around demanding more from the IEA. In a letter covered by the Financial Times, a broad collection of signatories called on the IEA to develop a truly Paris-aligned scenario (including a reasonable chance at staying within 1.5 degrees Celsius with a precautionary approach to Negative Emissions Technologies), and make this the central scenario in the World Energy Outlook (WEO), replacing the current dominant business-as-usual scenario. The letter’s signatories range widely: heads of major businesses, asset managers and leaders of major investor networks, former heads of state and politicians, leading academics and experts in energy, and more. 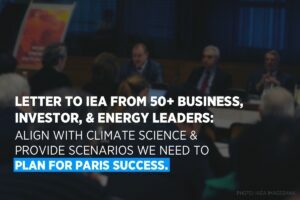 The suggested changes to the IEA’s WEO would have an outsized impact on everything from the urgent need to “shift the trillions” away from climate-incompatible fossil fuel financing to helping governments plan for success in energy decision-making to how we collectively conceive our energy future. The IEA has a mandate “to ensure reliable, affordable and clean energy,” and yet its main description of what the future of energy might look like, the “New Policies Scenario,” assumes we are still on track for between 2.7 and 3.3 degrees Celsius of warming. And since that is the future the IEA emphasises, energy decision-makers treat it as the default, most likely outcome. The resulting policies and investments risk making it a self-fulfilling prophecy – past expansions of fossil fuel development in places like the Australian coal basins and Canadian tar sands have cited the IEA’s scenarios as justification for continued build-out. Even IEA’s “Sustainable Development Scenario,” which is little more than a footnote in the IEA’s press releases, falls short of the Paris goals. Both assume that fossil fuels will continue to dominate our energy mix for decades to come, an assumption that dangerously underestimates our collective ability to do what it is necessary to address this challenge. This ambition shortfall is even more egregious on the heels of the Intergovernmental Panel on Climate Change’s “Special Report on Global Warming of 1.5ºC” released last fall. One of the great successes of the Paris Agreement was that it made a fossil fuel-free future seem possible. As a result, we can imagine renewable energy powering economic development and providing energy access for all, we can imagine transporting ourselves and our goods without diesel or petrol, and we can imagine a managed but ambitious transition of workers, communities, and economies away from dependence on the energy of the past. This expansion of the collective political imagination is critical to our shared progress. An emerging group of actors are redefining “climate leadership” by putting an end to approvals and financing for fossil fuel expansion, and setting critical global precedents for what a phase-out of oil, coal, and gas can look like. But the majority of energy decisions around the world are not yet this forward-thinking, in part no doubt because they are based on energy scenarios that lead to failure. A failure to plan for success is a threat not only to the climate, but to our economies as well. Investors make decisions based on the IEA’s energy demand scenarios daily, and failing to get it right threatens billions upon billions of dollars in capital. As it stands, even the IEA’s so-called “climate scenario” is encouraging massive continued investment in fossil fuels that we cannot burn if we are to stay within the Paris limits. This dangerous combination of capital and climate risk must be addressed. The world needs scenarios that assume success in meeting our collective goals, rather than projections of current and inadequate ambition. Recognizing these risks, the signatories of this letter are using their positions as key WEO users to demand the Paris-aligned ambition we need from the IEA. The IEA has deep and rich expertise in projecting our energy future, but it is time for it to evolve. We need a vision for the future that is predicated on success, and this new climate scenario must become the centerpiece of the IEA’s annual flagship World Energy Outlook. We are living in times of exciting and unprecedented change: Commitments and actions that would have been unthinkable just a few short years ago are challenging our assumptions and our imaginations. We cannot afford to underestimate ourselves by assuming that the future will do little more than follow the trends of the past. We must base our decisions on assuming success, and embrace the bold leadership it will take to get us there.